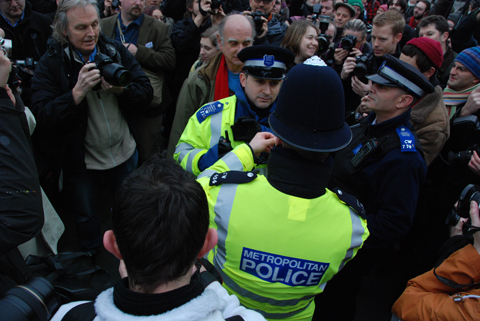 The Metropolitan Police has warned officers they risk breaking the law if they stop photographers, using counter-terrorism legislation. The latest caution is contained in the Met?s ?Photography Advice? for officers, a recently amended version of which now appears on the force?s website. The original guidance drew criticism from photographers for failing to make clear that, for example, police do not have the right to confiscate or delete photos without a court order. However, the Met has since altered the advice, adding several crucial paragraphs that warn police officers they may be acting unlawfully if they choose to ignore them. Regarding Section 44 and Section 43 [Terrorism Act 2000] stop-and-search powers the advice for officers now states: ?Officers do not have the power to delete digital images or destroy film at any point during a search. Deletion or destruction may only take place following seizure if there is a lawful power (such as a court order) that permits such deletion or destruction.? Guidance for using Section 58A, which makes a photograph of a police constable a potential crime if police deem it likely to be useful to a terrorist, now states: ?It would ordinarily be unlawful to use Section 58A to arrest people photographing police officers in the course of normal policing activities, including protests, because there would not normally be grounds for suspecting that the photographs were being taken to provide assistance to a terrorist. An arrest would only be lawful if an arresting officer had a reasonable suspicion that the photographs were being taken in order to provide practical assistance to a person committing or preparing an act of terrorism.? It adds: ?There is nothing preventing officers asking questions of an individual who appears to be taking photographs of someone who is or has been a member of Her Majesty?s Forces, Intelligence Services or a constable so long as this is being done for a lawful purpose and is not being done in a way that prevents, dissuades or inhibits that individual from doing something which is not unlawful. ?